The Boise Choruses invite you to a night of song, joy, and special music from the heart! Boise Women's Chorus and Boise Gay Men's Chorus bring you a joyful celebration of music in support of the "Boise Kind" initiative. City Council representative, Lisa Sanchez, will speak about the City of Boise's new initiative which aims to Define, Preserve, and Foster the Boise Community's Kind and Welcoming Nature. 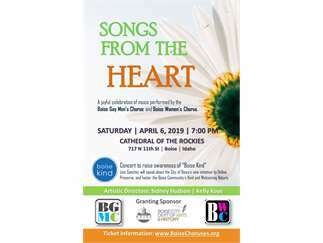 Join us for Songs from the Heart!